you wondered why the Indian woman looked familiar......she is probably best known for "Dances With Wolves." She was the wife of the Indian that was described as a "holy man" and had adopted the white woman into his family. She has been quite a few movies. She also stared with Brad Pitt in LEGANDS OF TGE FALL, as PAT ! They cld not do the real bear scene bc there are no bears in Scotland. However, in LEGANDS OF THE FALL, they had a great bear named Bart. His owner/ trainer wrestled with him in the last scene of the movie where Brad is supposed to be killed by the bear he let live earlier in the movie. Bart also was in the movie with ANTHONY HOPKINS, in the movie EDGE! Bart died soon after, & his trainer has a Bart, Jr. that he uses now. The letter was to Janet, her name appears in the upper rt hand corner of the letter. I assumed it may have been the letter that Ian sent to her to tell her he was staying in America. I sure hope you get to read this. I have read every book at least twice, & again every season before it begins. Nice recap ladiesI, like you, still trying to stomach the man/bear story. For the live of Ivy, what fantasy books are these writers getting their ideas from. Question??? Who the hell is Andy Dupree???? Thé wise lady is Tantoo, she was the wife of Kicking Bird in DWW and the movie with Brad Pitt, Aiden Quinn, cannot remember the name, it also has to do with bears, real one. Claire did actually wear pants when they were leaving River Run with John Quincy Myers. I can't remember where she got them, but Jamie had a fit because they were so revealing. Hey guys! Carol glad to see you drinking again! I loved this episode too. I did think the bear thing was weird but I thought that part of the book was stupid also, no way a man is killing a real bear. The Indian speaking English was weird too but I think there was always a couple of them in each tribe who knew English in order to communicate. Maybe it will come up in a future episode. The Indian grandma is also in Frontier the show on Netflix with Jason Mamoa. You guys crack me up, look forward to your podcasts every week. Hi Lasses, I enjoyed - as always - your recap of 404. Do you listen to the Official Outlander Podcast each week, where the showrunners comment on the episode? Matt Roberts said they went to NC and got background on the costumes the Indians would have worn then. So it's pretty authentic. On an aside... Carol, you should check out a British TV show, Detectorists. 3 Series. Two gentle souls spend their days with metal detectors, dreaming of finding a fortune. I watched it on Acorn TV, but it's also available in my public library. Good guest stars, like Dame Diana Rigg and her daughter, Rachael Stirling. Cheers! Hi Girls! Always fun to laugh with you two about my favorite like/hate TV show relationship. I know, I know, I'm that die hard book lover that's hard to win over. I have no problem with alterations to make the story fit into its format, I totally get that. What I don't get is the truncation of personality traits in characters that make the story what it is - Fergus being a perfect example. Love the actor, love his looks, just give his character Fergus's personality and he'd be the total package. Fergus was tough, passionate and cunning in the best way. This Fergus is only happy go lucky and it robs the story of what he brings to it. At least we had none of Claire's lip curling in this episode. In the beginning of the TV series, they were very particular in the details and I feel like that is going by the wayside. I find myself yelling at the TV things like: "What, did Rollo tunnel out of the shelter to bark in the night?" (Because surely they would've shut the door.) "Don't shoot target practice right beside the axe! You need it!" Roaring overnight fires, ready fuel soaked torches, shooting at bears with no good shot in the dark woods and "WTF IS THAT BEAR MAN???!!!" I get that they needed to make peace with the Indians, but it was ridiculous and discredited everyone involved, imo. Building a travois in the pitch dark and the perfectly manscaped Indian who speaks accent-free English and better than most modern day Americans was unbelievable. Sure he can speak English, but how about with a touch of Cherokee inflection? - like everyone else on the planet speaking a second language? My husband, who (cough) bears a likeness to Clint Eastwood in both looks and manner, watches the show too and was so put off at the details. As a 30 year retired soldier and shelter building, hunting, tough guy who's also a Rogers Rangers living historian, his Eastwood-like comments are entertaining. I saw a flicker of the real Jamie in Tryon's office and more so delivering the dead bear man. Please let that Jamie come to the party more, we love him. The shelter was cool and better than the books. I do believe the structure they're building is the cabin, maybe they work on the big house when others come? The Indian clothing was terrific. I look forward to seeing them much more. I enjoyed watching them build their home and life there. I like the change in John Q. Myers character, he's much more useful to the story. Who knew he lived just right across the woods? Hi ladies! I put a picture of the blue ridge mountains on the Facebook post, the mountains do go on and on. I think the building is the cabin and the stick house is the lean to..it's just bigger than described in the book. I also think that the bear man is a hybrid of the bear and the ghost Indian thing from either Fiery Cross or Breath of Snow and Ashes..I can't remember which one. I was ok with it as long as he is the bear killer. I love this part of the book when Claire talks about building and daily life on the ridge, but that stuff was too boring to put in the show. Hopefully Lord John shows up in the next couple weeks, I really hope they don't leave that part out of the show. Hope dinner was great and looking forward to next week! When the new BBC version of Poldark began in 2015, I loved it so much, I almost got the Winston Graham 12 book series to completely immerse myself in late eighteenth century Cornwall, but one thing stopped me and that was my book vs TV experience with Outlander. Don't get me wrong, I have loved, loved both versions of Outlander, but I have found that I view it differently based on my personal investment of material. Some things I let go, some detail...not so much. Just as the carving of the J\C initials on the hand in book 1 was such important symbolism to me, so was Jamie's single handed killing of a bear. It elevated his status as a justifiable legend (no easy task) to the Cherokees and made his position as a leader of settlers undeniable. However, as Diana has said herself, the book is the book and the show is the show. So I think I will just wait and let BBC Poldark finish their story...and in a few years, I will enjoy the books. I just bought the Drums book that has a cool picture of Jamie and Claire on the cover. I started out as a series watcher but have been reading the books after the current series. It was a really good episode—I liked the part about the knitting and also Roger’s discovery in the book. The scene where the Indian grandmother mentioned Claire’s hair going white made me laugh (the wig makers are probably going “we just added more gray to Claire’s hair and now we have to make it white!”). Can’t wait for the next episode. I love you two! Please stop apologizing for the length of your tape each week, we can see how long it is before clicking on it. Besides, my commute is 45 minutes each way so it works perfect into my Monday :-) The Brad Pitt movie was The Revenant. I love Jamie and Claire saying "it's like a picture" while standing on that rock because it literally IS a picture. The irony of it is so funny. I'm a book reader and this book is my favorite in the whole series so I very much disagree that there are not high drama plot points and there is a reunion to look forward to and maybe another one that we are all hoping for, not to mention people meeting certain other people and.... Anyway, I thought the bear dude was a great switch from the book. They steered away from the Claire killing a wolf because it's implausible and hard to tape so I think it was the same case here. I don't know what they did this week, but Jamie's wig was tons better. Also, church poetry hahaha. Regarding the cabin. If I recall this is their first house and then Jamie build a bigger 'big' house (Claire gets a surgery, they get second floor bedrooms etc.) The former cabin gets occupied by family who come to the ridge. And that is the place J & C have to move into, with others, when......spoiler from the newspaper clipping, happens. Love listening to your reviews each week. Unfortunately this year life has intervened on my being able to watch the Eps live, so I catch up later in the week. Hugs to Carol & Tom - keeping your family in my prayers. 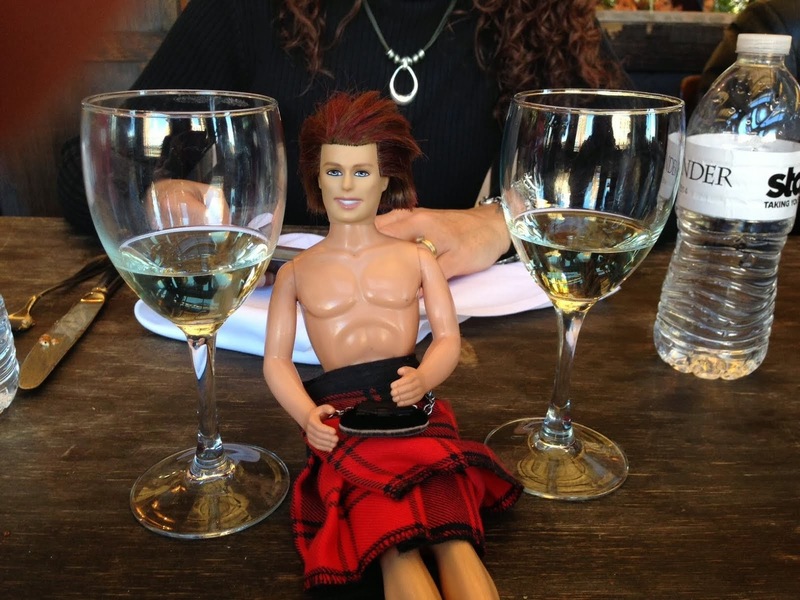 It was my hubby's own medical issue that kept my away from Outlander on Sunday. His issue has, we hope , resolved by now, but Sunday night was stressful. I did enjoy this episode thought agree with some of the points you made that disappointed you also. Not a major story laden plot, but not much for cute personal interactions either. Just good summarizing of sections of the book that they had to 'fit in'. Hi Carol and Tracy. Stop apologizing for the length and content of your videos. There are plenty of people like myself who are here for years because we love the videos...so you two keep doing you. A couple of things about the native Americans. Tantoo Cardinal is a very famous actress and you probably recognize her from Danes With Wolves, Legends of the Fall and Dr. Quinn, Medicine Woman...in additional to a 100 other Imdb credits. I'm looking forward to her scenes with Claire next episode. In the book, the granddaughter is the daughter of a French trapper, and in the book she speaks FRENCH to Claire, not English....so that switch is just plain silly. Same with the other Indian. They spoke French, not English. I think Jamie is definitely building the cabin, not the big house. I was ok with them not making Jamie Davy Crockett. I mean I know he is JAMMF and all, but it was a stretch that he could kill a grizzly...especially in the pitched dark never having even seen one in person...the same way that Claire could have killed those wolves herself. Sometimes DG's stuff isn't even remotely believable. All in all, I thought it was a good episode. I replied earlier under a woman who replied on the 26th. Please read the info I presented there. I think it might make it easier to understand WHY some of the scenes were changed. However, if theycld bring 50 old 70s cars from the US, why not get the bear trainer & his bear since there’s no bears in Scotland. He’s just an awesome man. Of course we all know in the book, Jamie kills the bear with his dirk. Claire is hitting the bear in the face with fish, to attempt to get the bears attention. Jamie shares the meat with the Indians, bc the bear has been unable to be killed by them, & it has destroyed there property & eaten their winter surplus. Also, I laugh every time I read it, bc after the bear is dead, Jamie asks Claire why she was hitting him in the face with fish while he’s trying to kill the bear. Lol. Also, in the book, Claire’s shoes are found on the doorstep on the cabin, as no one knew she was missing. A huge rainstorm had hit, everything was flooded, & Claire, being her hardheaded self, tries to get back to Frasers’ Ridge after delivering a baby. So, no one knew she was missing. Jamie & Ian found her, after seeing her shoes. So, another fast track to the series. I dearly luv Outlander. I watch it over & over. & if you didn’t get my comment above, the Indiana Lady also stared in LEGANDS OF THE FALL with Brad Pitt & Anthony Hopkins. Brad let a bear go that was killing cattle bc he & the bear had an incident at the beginning of the movie. At the end of the movie, Brad supposedly gets killed by the bear. However, the trainer/owner played that part with Bart the Bear. Bart also stared in THE EDGE with Anthony Hopkins, & Alec Baldwin. He died shortly after that. But, he now has a bear he named Bart Jr & he’s awesome. The letter was to Janet, look at the far right side of the letter. I was thinking it was most likely from Ian telling his Mom his decision to stay at Frasers’ Ridge ??? Maybe? Thx for all you do. I luv watching you two. You make me laugh every week. I especially luv your comments about Twlight. I watched every episode. Sherry Kuhn from Danville, West Virginia. We have a mound here in South Charleston, that is full of American Indians artifacts that has been preserved. God bless & keep up the good work. I simply laughed my a$$ off when Carol coined the term "Bear Dude" and when Tracy said, now the Native Americans call Jamie "Bear Killer" and Carol said, no, they call him Bear DUDE Killer. OMG. Still laughing 30 minutes later. All the podcasts I listen to have made fun of this part, and they were funny, but you girls take the prize. Thank you ! Needed the laughter after a hard week at work. Love you both. I'm a week behind sharing my thoughts on "Bear Dude" but here it goes, my theory for the change. I think the production team knew they didn’t have the special effects budget to film a Bear scene well and feared film Jamie fighting a Bear would look like he was battling a puppet -which only works for Westley because Prince Bride is a fantasy/comedy. Jamie wrestling a rodent of unusual size won’t work for Outlander the way it does for Princess Bride. Instead they went with a man dressed as a Bear which isn't as crazy as it first seems. I read a book (Mrs. Pollifax and the lion killer) that took place in African, there was a tribal tradition of a man wearing a lion mask and using the real claws to attack people. Think of “Bear dude” not as a poor substitute for a real bear, but as a historic version of our modern-day, horror-film, ski mask, killer. You know it’s a disguised man but the mask/outfight A) hides the killers’ identity and B) is creepy for the victims being stocked, so “Bear Dude” is a good intimidation tactic. Furthermore, not anyone was allowed to dress-up as the lion, it could be the same for the Bear outfit. If only a great warrior earns the honor of wearing the Bear suite then the Natives would know the “Bear Dude” was a great warrior thus Jamie killing him would still be an impressive achievement that would prove his strength and skill to the Native people.